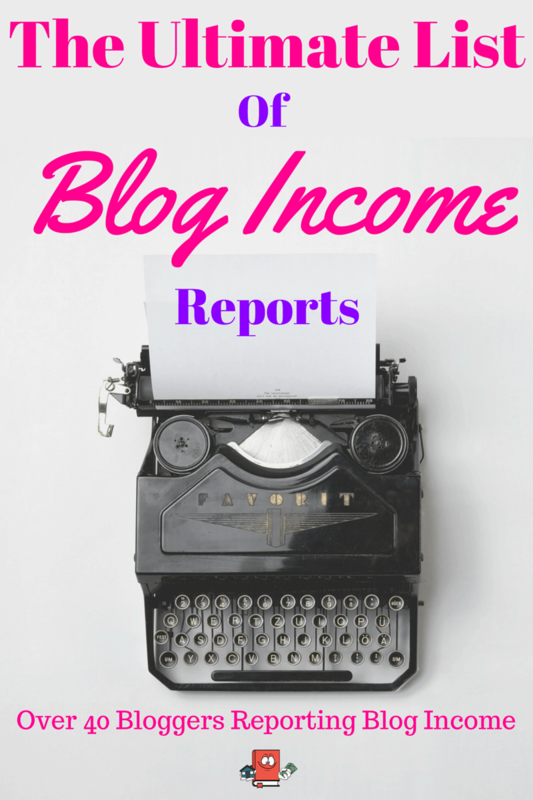 Owning rental properties can be a great source for generating passive income. As a matter of fact, rental properties is going to be what takes me to early retirement. I dream about the day when I can finally quit my day job and live life the way it was supposed to be lived. Free! Freedom is the key word that comes to mind for me when it comes to early retirement and the only way I can reach that freedom is through Financial Freedom! I now have five investment properties (4 rentals) and am looking to acquire as many as I can get so I can achieve my dreams. Three of these rental properties were purchased turnkey and are in a different state then the one I live in. This was a hard decision I had to make because I am not able to find good cash flowing deals in the market I live in. It takes hard work and discipline to be able to achieve this and it will be very important to continue having these successful traits during my growth mode. Part of the reason why I have been successful so far is because I have strict criteria on the rental properties that I purchase and treat this as a business. I don’t let personal emotions decide which properties I will buy. When I am searching for a new turnkey property to acquire, it is super important that the proper due diligence is done to determine if the property is a good deal or not. It is very important to research all the information that is provided to you by the seller. In most cases, the turnkey provider (seller) will give you all the numbers you think you need to see but I warn you to take all this information in with a grain of salt. Make sure you properly vet your turnkey provider and do your own fact-finding on each potential property. And be sure to check out this step by step guide on how to purchase a turnkey rental if you are a beginner investor. Determining the actual market rent values on your investment property is one of the key specifications that is needed during your research phase. It can be very difficult to determine these amounts on your own when you don’t have any local knowledge of the city you are thinking about buying in and you don’t have access to the local MLS. With the methods below, you should be able to estimate what the market rent prices are for any property you are looking at in any city. These are the very same steps I take when I am evaluating a new potential turnkey property. These tools are how to determine market rent on out-of-state rentals. It is best to use ALL these tools to come up with your market rent price. Do not just pick one of these and assume it is correct. 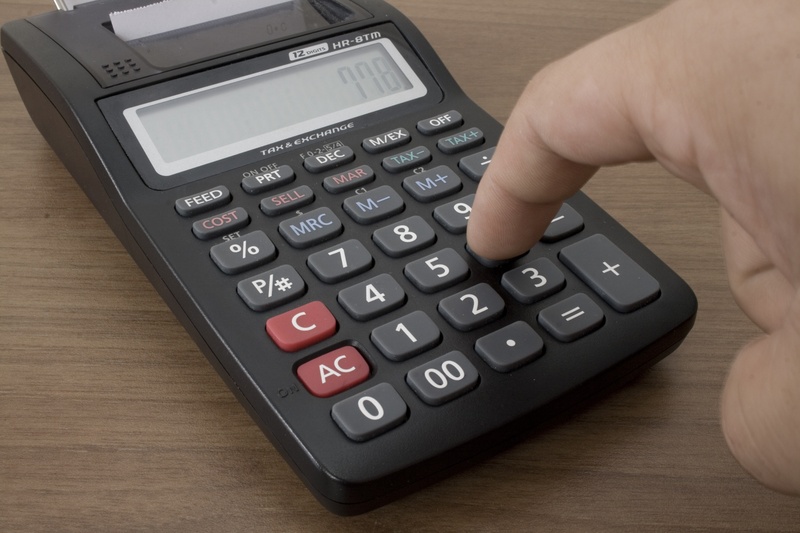 The results and average you get using all these methods will give you the knowledge to see how much your new potential rental property will rent for. Choose the craiglist that is in the city you are purchasing in. Looking at the current rental listings on craigslist will help you see how much current property managers and landlords are listing the units for. Be sure to view these listings in the same neighborhood as your potential rental property. You do not want to get too distant from the actual house you want to purchase as this could provide incorrect data. You also need to make sure you compare the size of the house (square feet, bedrooms, bathrooms, etc…) and that it as similar as possible as the house you are looking to acquire. It is best if you use the “map” feature when looking at the craiglist housing rentals. For example. Let’s look at the image below. The image below is of the popular Bates Hendricks neighborhood in Indianapolis. This is the same neighborhood my 3rd turnkey rental is located in and I really like this area. Notice the green arrows, there are 10 different listings in the same neighborhood all available for rent right now. 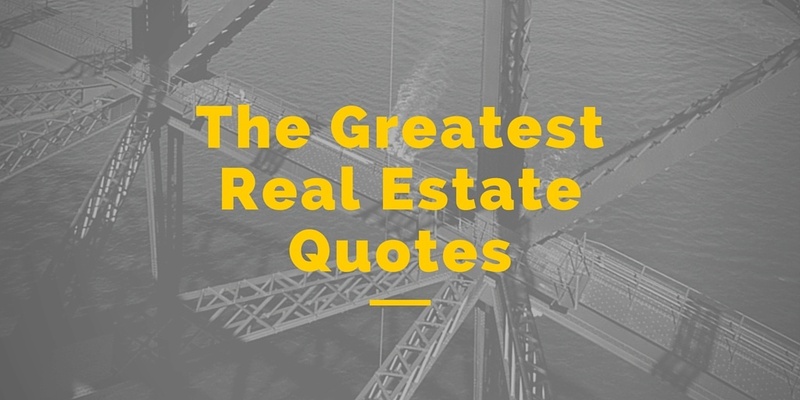 You will want to click on each one and compare these with your potential rental property. Once you find a similar property, you will then acknowledge this rent price as a potential market rent for your future rental property. After you select “Analyze My Rental”, you will be shown your results as well as all the houses used to help determine these results. Lets analyze the image below. 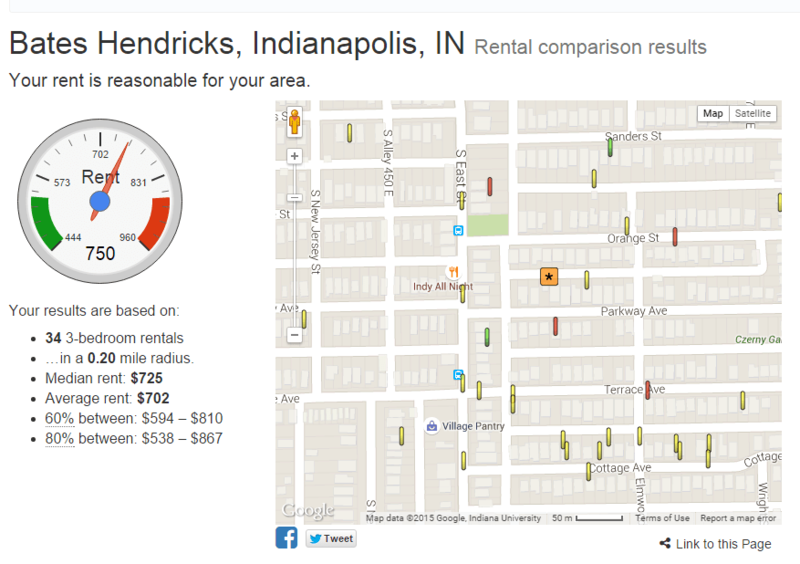 The meter/gauge on the left shows you that $750 is in the median rent range in that given location. The GREEN area on the gauge represents a really low rent price. The RED area on the gauge represents a really expensive rent price. $750 seems to be a good rental price for that particular neighborhood. This tool can be very accurate in some cities and not so accurate in other cities. This is why it is important to use ALL these tools to get your final number. 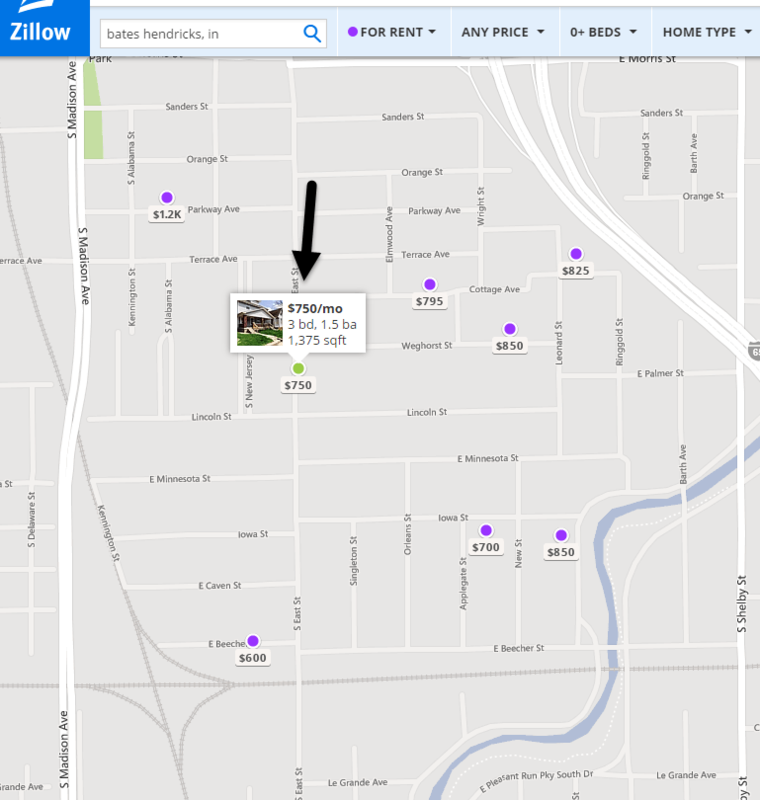 Zillow is another great resource that can be used to help determine market rent for free. It is very similar to craiglist in which you will be able to see what the current listings are in your neighborhood. Be sure to choose the “For Rent” section after you type in the address of your potential rental property. See image below. This image shows you about 7 different houses all for rent in the same neighborhood as above ranging from $600 to $1200. You will need to click on each listing and compare it with the rental you are thinking about purchasing. Only use properties with similar attributes to help determine your market rent. This is very important. Trulia is another online resource that you can use just like Zillow to look at current rent listings. Not every city uses craigslist, not every city uses zillow and when that is the case, you can use Trulia to see if the listings are on there. 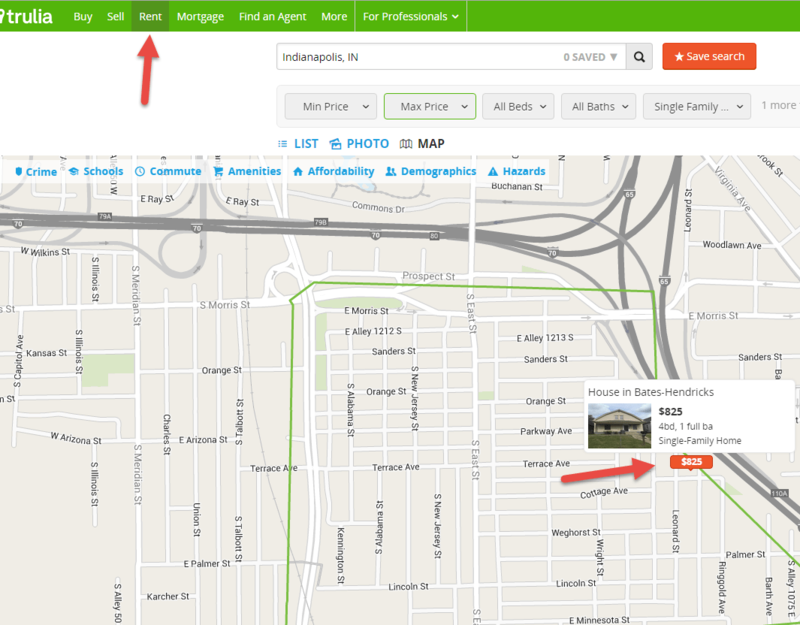 Make sure to choose the “Map” view and review each listing for comparisons. As you can see in the image below, there is only 1 rental located on trulia for the same neighborhood I have shown you using craigslist and zillow. 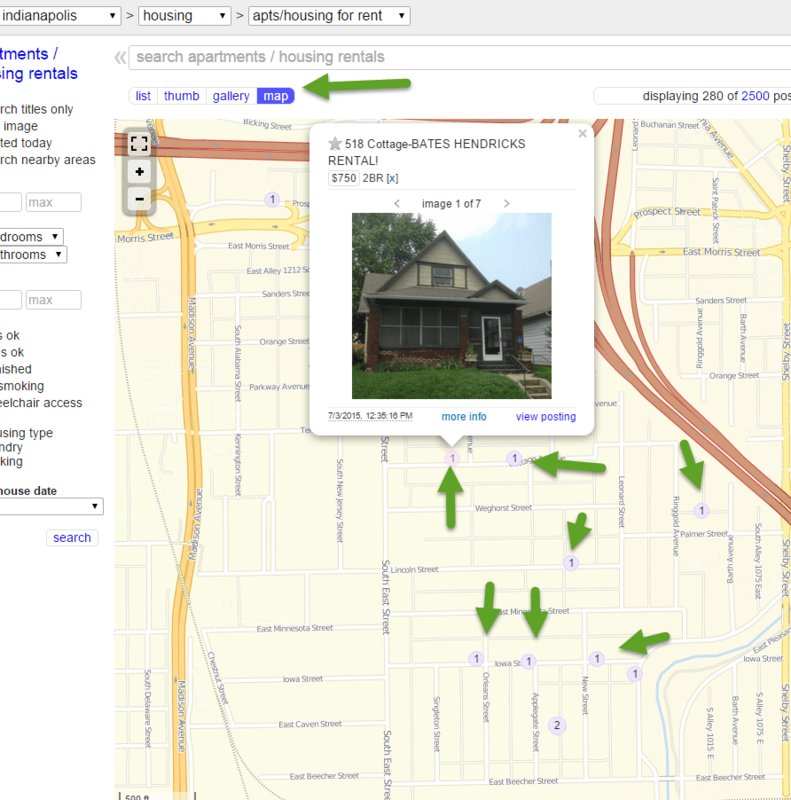 It appears Indianapolis likes to use Zillow and Craigslist to advertise the rentals more than any other online resource. Last but certainly not least. If you are purchasing an out-of-state rental property then I highly recommend you use a property management team to manage your rental. Having a good property management team is one of the most important pieces to have and can make or break your investment property. Once you determine which property manager you will be working with, it is okay to give them a call and ask them to provide you with rent comparisons for your future rental property. You should always run your potential rental property by your property manager to confirm it is in a location the PM is willing to work in and as well as to help you determine what the market rent should be. The PM should be local as they will have the best knowledge on what your property should actually rent for. Oh and be sure to properly vet your property manager. You only want the very best! These are all the methods I utilize to help determine actual rent prices on potential investment properties. If what you find is much different then what the seller is pitching to you, then I would take this a red flag. Ask them how they came up with this number and show them your findings. Then research what they told you to see if it is accurate or not. I have heard of times where sellers will somehow manage to rent a property out for more than what it is worth, then during the next tenant turnover, you are no longer able to get the same rent price and you end up losing money and your estimated returns turn to crap! Don’t be the person that buys this property. Make sure you know what you are getting yourself into and can see for yourself the marketed rent price matches with what you are finding on your own. Can you think of any other ways to determine market rent values for free? A great method would be to check with a real estate agent in the area who specializes in rentals. Hi George. You are absolutely correct. If you will be using a realtor then they can also provide the info straight from the MLS. My options are geared more for if you will not be using a realtor or have access to the MLS. Good point though! I appreciate the comment. I sometimes start a bit high. Lower price every two weeks, until you get a decent amount of calls. If 2-3 qualified people look at you place, and do not rent, you are too high. Price too high, all you get is trash. That is a great way to determine market value once you own the place Eric! Thanks for tidbit! Good stuff! Thanks for these great tips! We are small-time landlords (just one property), but welcome good advice from those who are farther along. Youre very welcome! Hey one property is better then none right? You planning on getting anymore rentals? Thanks Income Surfer! Most of the out of state investors I have spoken with are all from california actually. It is very difficult to find cash flowing properties there for sure. If you are ever ready to take the plunge let me know and I would be more then happy to help. Thanks for sharing your tips and tricks for researching rental properties. Rentometer looks really interesting. Thanks for stopping by Steve! Rentometer is great and Ive heard from multiple investors in different states that it is accurate. Congrats on your prospective tenant. It’s a great feeling when you secure a good tenant. I don’t blame you one bit, the longer it sits vacant, the less cash flow you make! I’m the same way but I’m also super picky on my tenants. Great post. Doing detective work and getting a good gauge on rents should be a required part of anyone’s due diligence period. As I’ve learned first hand, static rents are not all that much fun, so it would be beneficial to locate certain pockets that increase slightly from year to year. Thanks Jay! Actually yes you make a great point. The market rents should be rechecked every year. I know in my city, the rents increase every year for sure. Not so much in the midwest but it would be a crime not to re-evaluate the rent prices. Thanks for great tip! 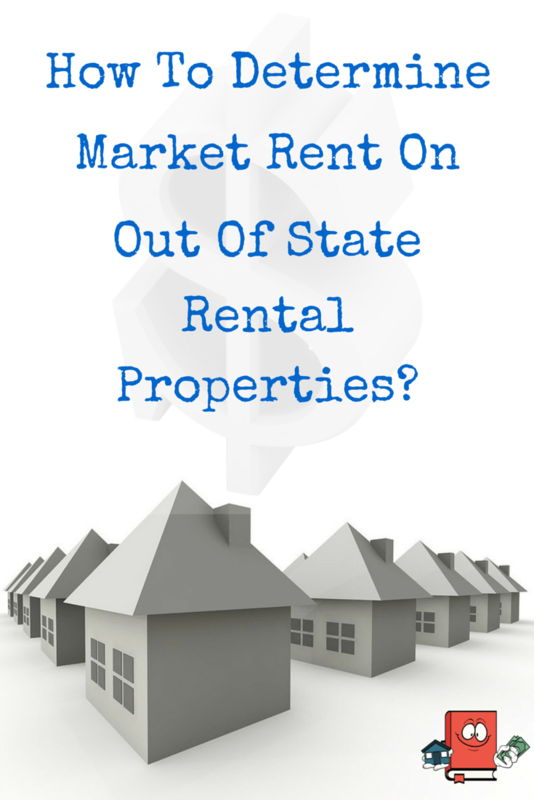 It is really difficult to determine market rent until you actually have a rental home and have it rented. Hi Edward, over here in the markets I deal with it is not difficult to come up with the market rents but I imagine that can be very dependent on your locale. Good point! Thanks for commenting. You’re definitely becoming somewhat of a “thought leader” in turnkey investing here! I would love to hear your ideas on how to potentially grow/monetize. Feel free to shoot me an email. I have been thinking about making a financial freedom post but to be honest, I dont know what that number is for me yet. I could spit out a number now but I know it will change after im married with kids. For now, im kind of just in “grow as fast as I can” mode and then later on, depending on what I have, I can re-evaluate to see what I need. Okay great, I’m about to head on a trip from tomorrow for 10 days over to Papua New Guinea however I’ll have some time to shoot you a note once I’m back before heading back to the 9 to 5.. Cheers and keep up the great work though, you’re doing awesome! Hi, have you tried RentRange.com? I’ve been happy with their service and they seem to be more thorough all around then what I’ve seen. It does cost $14/report but you get a free one once you sign up. I have not tried rentrange. Im not keen on paying for this kind of info since its so freely available with a little research. But thanks for the suggestion.